Format: A short story between 400-600 words. We accept stories in both English and Chinese. We also accept videos (2-3min) and photos with brief comments. Content: We want to hear your personal connection and experience with China. It can be something cultural and leisure, such as your travel in China, your time with Chinese host family, or your appetite for different Chinese food. It can also be something more serious and policy-related that comes out of your observation and reflection. For Chinese students, we want to hear your experience of bridging China and the world. Define your story in your own way! Winners of the contest will be selected via public reader voting from April 1st to 3rd. A recognition party after the results come out! Stay tuned! Please submit your story by 11:59 pm, Sunday March 31st. 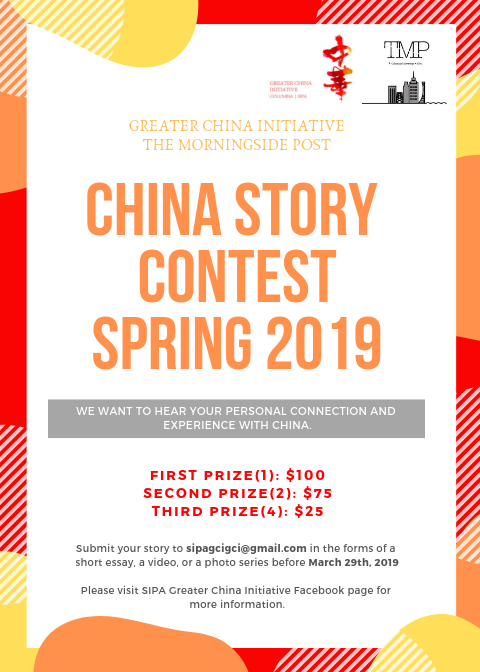 All submissions will be posted on The Morningside Post under 2019 Spring China Story Contest. Please direct any questions or suggestions to sipagcigci@gmail.com or simply leave a message on our Fb page. GCI will reply asap! We look forward to your amazing stories!